units, or after June 1918 when the Jewish Legion was first dispatched to Palestine? The history of the Jewish Legion that fought in Palestine in World War I is relatively unknown. 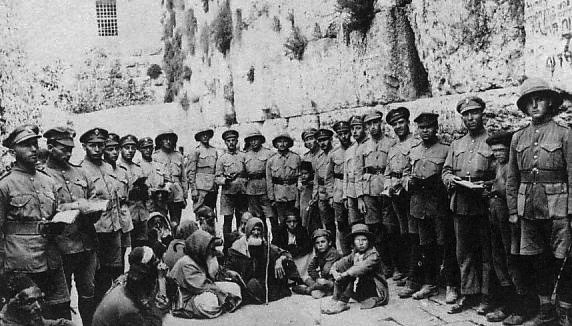 Many of the soldiers were recruited from the ranks of the disbanded Zion Mule Corps, Palestinian Jews exiled by the Turks in April 1917 who were recruited in Egypt, or from Diaspora Jewry recruited in Canada and the United States. As many as 500 Jewish Legion soldiers came from North America, with some sources claiming the majority of them were from Canada. Many of them were originally from Poland or Russia. one month after the "draft" of soldiers for the Jewish Legion began in Canada. By September 1918 the Jewish Legion was already in Palestine. One Legionnaire was Leon Cheifetz from Montreal who enlisted before the age of 18. Cheifetz assembled an album with dozens of pictures and biographies of many of the Canadians who fought with him. Unfortunately, the huge Library of Congress collection of Palestine pictures has few photographs of the Legionnaires. The pictures in this series of essays come from various other collections, and we hope to receive more from the descendants of soldiers who served in the Legion. Re; "Jewish League Fort Edward Nova Scotia 1918." Walter G. MacLaughlan, the man who took this panorama photograph, was very meticulous and accurate with regard to his captions and would never have made the glaring error postulated in your caption. Although the 38th and 39th Battalions had been deployed to Egypt by March and April of 1918, new recruits were still being trained at Fort Edward. There is no viable reason to doubt the veracity of the date in the caption, 7 September 1918/5629 or to even suggest the photograph had been taken a year earlier. The date in the caption is,of course, 17 September 1918/5679 and not 7 September 1918/5629. Apologies for the typos. All else stands. Ben Gurion, Ben Zvi, and others are in photos with my grandfather and several other of my relatives, taken in Canada on their way to Nova Scotia to train for service. My great uncle Nathan Rozovsky took the pictures.